The future of Airbnb is not the guy who rents out his place on the weekend. It’s the professionals who know what they’re doing, and sell rooms every night of the week. This is the real debate going forward. When Airbnb talks about its legal troubles in New York, Berlin, Amsterdam, and elsewhere, it claims that existing laws were never designed for its new brand of disruptive peer-to-peer business. There were laws created for businesses, and there were laws for people. What the sharing economy did was create a third category: people as businesses… They don’t know whether to bucket our activity as person or a business. In 2010, the State of New York passed a law designed to crack down on bad actors that operate illegal hotels—a goal we all share. Unfortunately, the 2010 law also had the unintended consequence of impacting regular New Yorkers. There are more. You get the point. There are no laws governing Airbnb because until very recently, there was nothing like Airbnb in the world—not of the same scale, not with the same guiding philosophy. And when Airbnb came onto the scene, regulators were forced to slot it into existing categories where it, arguably, didn’t belong—treating a bachelor renting out his spare room to make rent, for example, with the same rules as a scuzzy landlord operating an illegal hotel. They’ve been playing catch-up ever since. We are hopping into strangers’ cars (Lyft, Sidecar, Uber), welcoming them into our spare rooms (Airbnb), dropping our dogs off at their houses (DogVacay, Rover), and eating food in their dining rooms (Feastly). So when it comes to thinking about and dealing with this and other sharing-economy companies, the kind of business that Airbnb operates matters. Does it match the company’s self-portrait? Is the company as novel as it claims to be? Are its hosts “regular people”? It turns out there is an element of wishful thinking in the portraits of Airbnb. Last November, I took a look at Airbnb data from New York (here and here). In February, travel web site Skift carried out a similar study (here and here), which was part of the New York Attorney General’s case against Airbnb. The two studies took similar approaches, collecting listings from Airbnb’s public web site and gleaning what we could from that imperfect data set. Both studies concluded that, while it is true that a large number of hosts rent the homes they live in, hosts with multiple listings make up almost half of Airbnb’s business. Also that, while Airbnb makes great play of its origins in renting out an airbed, such rentals are now a negligible portion of its business. Even “spare rooms” are a minority of the business: the majority of Airbnb’s business in New York comes from the rental of entire homes. The data showed a company that was closer to orthodox models such as HomeAway and its subsidiary VRBO than the narrative would have it. There are differences—HomeAway is focused on vacation rentals, and many of its properties are run by property managers—but the similarities cast doubt on Airbnb’s claims that existing regulations are inapplicable. Now here we are: it’s six months on, and interest in Airbnb continues. Airbnb has kicked 2,000 New York listings off its site (10% of the total for the city). It handed over host data to the Attorney General (anonymized, the company says). Meanwhile, the company is valued at $10 billion, having raised $450 million in a new round of venture capital. The New York dispute is now over, but the sharing economy poster child is still here, bigger than ever, and still a leading light in the wave of digital disruptors looking to shake things up and make a lot of money. Is Airbnb’s business based on “regular people” in a way that other part of the hospitality industry are not? Is Airbnb’s business based on spare rooms and airbeds? I looked again at several cities I had collected (but not posted about) in November, so that I could look at how the business has changed in some of Airbnb’s key markets. I hoped that looking a second time at New York might have something to say about the 2,000 listings that Airbnb removed from the site in April, during its run-in with the Attorney General. For those who don’t want to read the whole thing, here are the quick answers. While a good part of Airbnb’s business is based on “regular people”, over 40% comes from hosts with multiple listings. This is different from Airbnb’s self-portrait. Airbnb’s claim that existing regulations don’t apply to it is at least exaggerated. The majority of Airbnb’s revenue comes from whole-home rentals. This makes the company much more like HomeAway and other vacation rental businesses. It casts further doubt on the company’s claim to be a new class of business. In some of its biggest markets, Airbnb may have maxed out the number of listings it can achieve. What’s more, there is a high rate of churn as individual hosts put a property on the market, have a few guests, and then take the property off again. Airbnb does not appear to believe its own claim that customer ratings provide an assurance of good experience. Airbnb says it removed 2,000 New York listings from the site because of bad experience, but at least half of those listings had good (4.5 or 5 star) average ratings from customers. I’m going to post this in two parts. Part 1 looks at the split between hosts with a single listing and those with multiple listings, and it also looks at how far Airbnb has moved from its “origin myth”, after which the company is named—the hosting of people on couches and in shared rooms. Part II looks at the change in Airbnb’s business over the last six months, including the changes in New York where the legal strife has been the loudest. If I have time and if there are requests, I’ll collect these three together and post a single PDF. 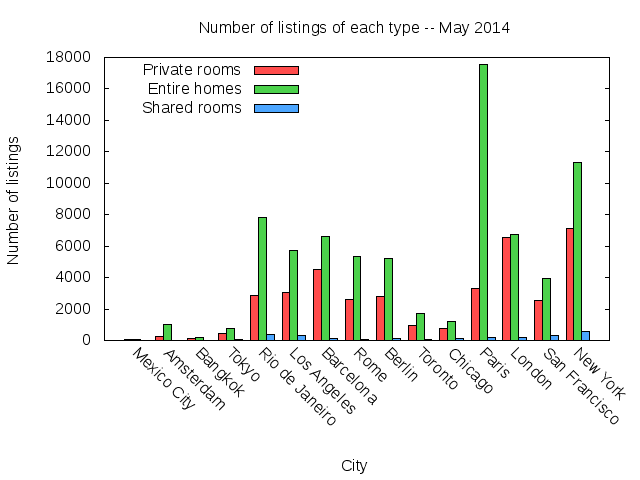 Just to set out some basic information, Figure 1 shows the number of listings and of hosts in each city. The data was collected using a fairly straightforward two-stage search. The first stage goes through all the search pages for a specified city and collects the room_id values. The second stage visits the room page for each value and gets details about the listing. The code is available on github. Airbnb has regularly said that is has about 20,000 listings in New York city. I find 19094 (and have over 20,000 from November) so the collection seems pretty complete. In 2013, Airbnb claimed 5600 hosts in Berlin. I find 6141. In the run-up to the World Cup, Airbnb claims to have 9,000 listings in Rio. I find just over 10,000. Perhaps the borders of the search are different, or the number is growing. Still, 90% accuracy is not bad. In short, the surveys for each city seem pretty accurate. Figure 2 shows the percentage of hosts in each city that have a single listing on the site. The values for New York and Amsterdam match Airbnb’s claim for New York and Amsterdam to within a percentage point, which suggests that the sample is realistic and that the use of a single listing is a pretty good proxy for “regular people who occasionally rent out the home in which they live”. The graph also shows that the claim applies to most of the big cities. Barcelona, Rome, and Tokyo are the only Airbnb locations surveyed that have fewer than 80% of hosts with a single listing. So far, so good for Airbnb’s self-portrait. From here on I will call hosts who have a single listing “regular people”. Imagine that a city has 100 hosts, 99 are “regular people” with a single listing and one host has 99 listings, then the percent of hosts who are regular people would be 99%, but the percent of listings on the market that come from regular hosts would be only 50%. Both percentages are important in gauging the kind of business that Airbnb is. 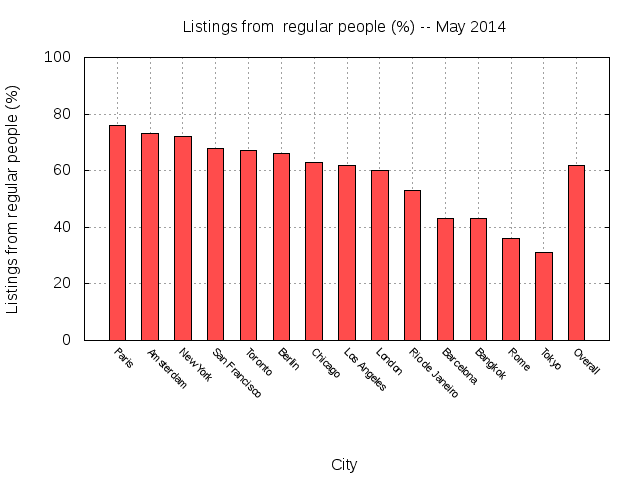 Figure 3 shows the percent of listings offered by regular people. The overall figure is 62%: still a significant majority, but a number that is 20% lower than the percentage of hosts. We can see that for a few cities, notably Barcelona (11,000 listings) and Rome (growing quickly, at 8,000 listings), the majority of listings come from hosts with more than one offering. The percentage of listings that come from different types of hosts corresponds to the experience of the potential guest browsing or searching the Airbnb site. The traffic generated by Airbnb is different, because not all listings are equally popular. There may be areas with many Airbnb listings but relatively few actual visits, while other areas may have listings that are visited very frequently. Airbnb does not give the number of actual bookings for each listing (or, nearly equivalently, the number of visits to the listing), but it does give the number of reviews that each listing has received, and this should be a reasonable proxy for the number of visits. 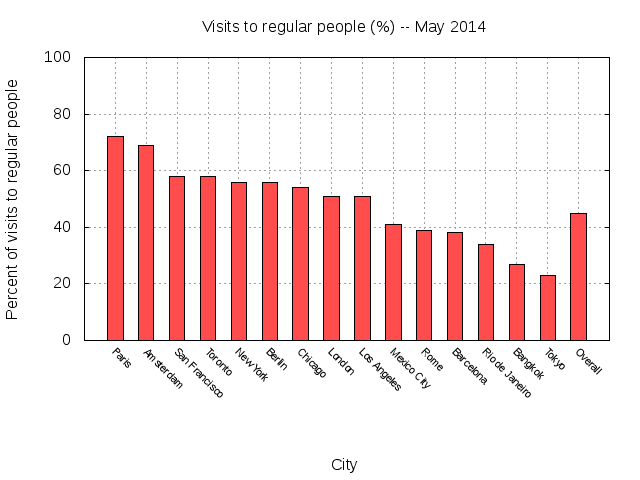 Figure 4 shows the percentage of visits that are to rooms listed by regular people. The numbers are getting significantly smaller now. No city has more than three quarters of its visits at properties of regular people, and several have a slim majority of visits to hosts with multiple listings. Overall, 45% of visits happen at places offered by hosts with multiple listings. There is one more step to take, which is to look at Airbnb’s actual revenue. What fraction of its business comes from regular people and what fraction comes from multiple listers? To get here, I multiply the bookings (proxied by reviews) with the listed nightly price. Again, it’s not a perfect measure but so long as regular hosts don’t overall have longer- or shorter-stay guests compared to other hosts, it should give a reasonable picture. Figure 5 shows the percentage of Airbnb’s revenue that comes from regular cities. Only three cities have over 60% of their revenue coming from hosts with a single listing. Overall, 44% of Airbnb’s business comes from hosts with more than one listing, which is slightly up from 42% in November (the increase may not be significant). Airbnb Listing Types: The story of Airbnb emphasizes the casual “airbed” rental, but this is a very small part of Airbnb’s business. Again, there are a couple of ways of looking at the data. Listings by Room Type: Every listing on the Airbnb site is listed as one of three categories: a private room, a shared room, or an entire home/apartment. Figure 6 shows the breakdown in each city. It is clear that shared rooms are a negligible portion of the total: about 1 in 50 listings are shared rooms. 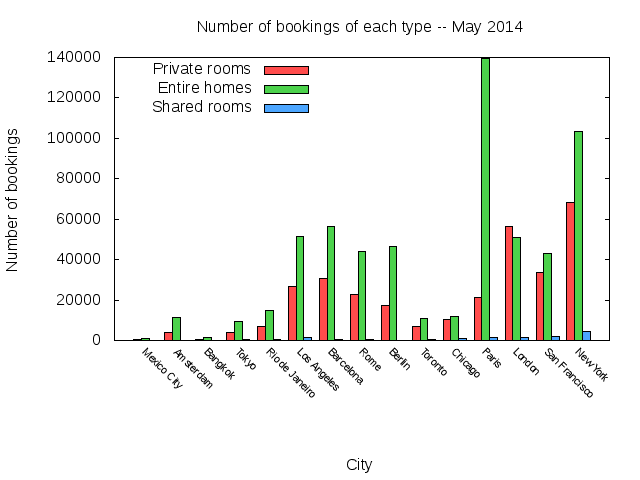 Figure 7 shows the visits by room type, using reviews as a proxy for visits again. Shared rooms are an even smaller percentage of the whole: only 1.4% of Airbnb visits are made to shared rooms. 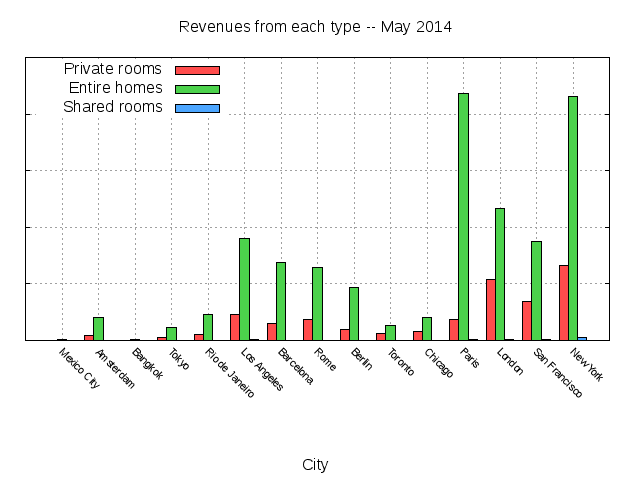 Using reviews * price as a proxy, Figure 8 shows the percentage of revenue from each room type. The revenue that comes from spare couches and shared rooms is a mere 0.56%. Figure 8: Revenue from different types. The data show that Airbnb is consistently economical with the truth when it describes its own business. It’s a long way from being just “regular people” and there is a lot more business coming from multiple-listing owners than they let on. The data say that it’s time commentators and the media stopped using the “Couchsurfing” narrative for Airbnb. At less than 1% of its business, the couchsurfing model is irrelevant for what Airbnb is today. It’s far more like HomeAway than it is like Couchsurfing. If there is a novelty to Airbnb’s business, it’s that it collects property managers, individual renters, and occasional renters under one roof, just as Amazon can offer best sellers, midlist authors and self-published obscura in the same place. And while much of the talk will be about the long tail of rooms, the reality is that Airbnb is pushing for the professionalization of its hosts, and we’ll see more of that over time. Other conclusions to come after we see the rest of the data. This article originally appeared on Whimsley, and appears here with permission. Tom Slee writes about the intersections of technology, politics, and economics. His book No One Makes You Shop At Wal-Mart is a left-wing game-theoretical investigation of individual choice and its problems. His critical writing on the gulf between Silicon Valley rhetoric and practice, and particularly on the politics of openness & sharing, has caught the attention, if not the agreement, of leading lights from various “Open X” movements. He has written for the Literary Review of Canada, The New Inquiry, and The Guardian.